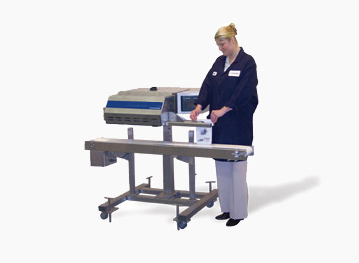 MS Medical Sealer | PAK Automation Ltd. The Supersealer MS Medical Hot Air Bag Sealer is the ONLY sealer on the market with Ethernet Network Connection to record all pouches being sealed right into your PC. One PC can monitor multiple sealers. This latest model is equipped with an Allan Bradley Touch Screen. Change of machine settings is as easy as a touch of a button. The Supersealer MS does not use Teflon coated bands. No bands means less replacement cost and decrease in downtime. A fully calibratable hot air heat sealer, it follows all the guidelines laid down for the Medical Packaging Industry. The sealer continuously seals a wide range of medical packaging materials including: Plastic, Tyvek, Mylar, Pet, Coated Tyvek, paper and plastic, laminated foil and metalized foil bags. The stainless steel construction of the sealer in combination with advanced airflow and state of the art process controls ensure continuous performance in demanding environments. Power: 115 VAC, 1 Ph, 60 Hz, 20 Amp. Meets FDA guidelines for medical industries. Optimum seal quality at low maintenance. Reliable performance and high quality design. Easy system control and monitoring. change over with minimal operator training. to computer network for complete process monitoring. Easy access to process data to meet FDA requirements.